As mentioned previously in this space, in crafting “PostClassical,” we consciously set out to “re-invent” classical–music radio – or at least to do something uncompromising: shocking and revelatory. Here (below) is Sudip’s whole piece, posted Feb 1. Doppelgangers: What does Schubert sound like on a jazzy bass trombone? I do not listen to the radio nearly as much as I used to, but when I was growing up, programs such as Saint Paul Sunday Morning and Karl Haas’s Adventures in Good Music were household staples, forming an important part of my musical education. I began listening to Haas’s program from a very early age, and I will never forget the opening of each episode, with Haas playing a passage from Beethoven’s Pathétique Sonata before uttering those famous words—“Hello, everyone”—in his genial, warm, and sonorous voice. I must have been seven or eight, home sick from school one day, when I first heard one of Haas’s “mystery composer” programs, in which the host would play several excerpts from a composer’s work, progressing from the obscure to the more familiar, challenging the audience to guess the author’s identity. I remember that sick day well, unable, as I was, to come up with the answer. It was the first time I heard the name Camille Saint-Saëns. Even when I do find time to listen to the radio these days, I rarely encounter a program that gives me the same sense of excitement and discovery that I felt as a child. But a few weeks ago I did, while listening to an Internet show called PostClassical, which features concert performances by PostClassical Ensemble, an innovative group of musicians now in residence at Washington’s National Cathedral. 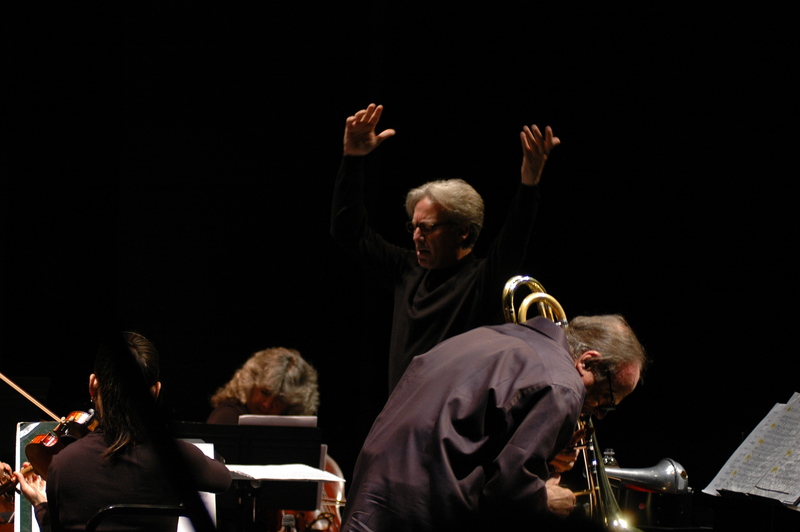 Led by the historian and writer Joseph Horowitz and the conductor Angel Gil-Ordoñez, the ensemble puts on concerts that are far from typical and often experimental, with the aim of contextualizing a composer or a piece of music with verse, theater, film, or dance. Every two months, Horowitz and Gil-Ordoñez join radio host Bill McGlaughlin (the former host of the aforementioned Saint Paul Sunday Morning) in the studio, to discuss their concerts in depth. The show I happened to hear was devoted mainly to Franz Schubert, in particular four late songs: “Der Doppelgänger” and “Die Stadt,” from the posthumous cycle Schwanengesang, and “Nebensonnen” and “Der Leiermann,” from Die Winterreise. Yes, there were traditional renditions of these lieder, performed with feeling and great taste by the baritone William Sharp and Seth Knopp on the piano, but the versions that were juxtaposed with these—jazz-inflected variants of the pieces performed by the bass trombonist David Taylor and the instrumentalists of PostClassical Ensemble—were what captured my imagination. Not in my wildest imaginings could I have envisioned such revelatory and shocking interpretations. These late songs of Schubert are dark, mysterious, brooding, full of despair. “Der Doppelgänger,” for example, depicts a man who has ventured to the former home of his beloved and is stunned and terrified to find his double standing there, revealed in the moonlight, staring up at the house and the sky. It’s an eerie enough work in its original setting, yet when Taylor seemingly improvised the solo line on the bass trombone, he transformed the familiar into something strange, still plangent and bewitching, but now uttered by a voice from another world—guttural, stuttering, flutter-tongued. With the orchestral accompaniment playing a steady, mesmeric dirge, the pathos was unrelenting, almost too much to bear. How had Taylor done it? I wondered. How had he conjured up a hazy, ghostly double of this moody Schubert lied? Later in the show, Taylor played “Der Doppelgänger” again, this time in a more extroverted, virtuosic manner. The same notes, but a completely different effect—the idiom more indebted to bebop and jazz, the orchestra sounding almost Brucknerian by contrast. The title of the episode was “Schubert Uncorked,” yet this was not so much Schubert let loose as reinvented. I had never heard anything like Taylor’s version of “Nebensonnen” (about the phantom-like appearance of three suns in the sky), in which he put his trombone aside and sang the solo line instead, floating the notes in the upper register as if he were some bardic gypsy from Eastern Europe, albeit one singing in English. In “Die Stadt,” he and the ensemble managed yet another transformation, turning the fog-bound city of Schubert’s song into some dystopian landscape, the sound of the brass trombone emerging from the murky depths like some antediluvian sea creature. “Der Leiermann” (or, “The Hurdy-Gurdy Man,” the concluding song of the cycle Die Winterreise) might seem to be an obvious candidate for this sort of imaginative metamorphosis. It’s an odd song, to say the least: at the end of his melancholy winter journey, the disconsolate wanderer-singer encounters a barefoot beggar on a street corner, shunned and reviled, playing a monotonous tune on his hurdy-gurdy. “Der Leiermann” has reminded the tenor Ian Bostridge of Bob Dylan. It’s a song, according to Bostridge, “that doesn’t conform to classical norms in singing,” one in which “it is hard to achieve the requisite vibe.” Indeed, when Bostridge was performing Die Winterreise once in Russia, “Der Leiermann” “emerged as a song that was hardly sung, rasping and guttural by the standards of bel canto.” His fear was that it would sound “like a ridiculous intrusion of pop singing into the classical world.” How appropriate, then, given this context, was Taylor’s version, both played and sung (the vocal line at times approximating the half-spoken half-sung technique known as Sprechstimme), with Zoltan Racz accompanying him on the accordion. It was a polystylistic marvel—reminiscent of jazz, folk music, Indian ragas—and almost symphonic in the density and conflation of textures, styles, and timbres. The two-hour episode held other delights: a hair-raising rescoring of Schubert’s Arpeggione Sonata, a moving version of the Adagio from Bruckner’s String Quintet, and two movements of the Bass Trombone Concerto by the Swiss composer and saxophonist Daniel Schnyder—kinetic, driven, seductive in its use of Middle Eastern idioms—yet it’s Taylor’s Schubert performances that have been haunting me ever since. I cannot get them out of my mind. To listen to “Schubert Uncorked” and other episodes of PostClassical, visit http://wwfm.org/programs/postclassical#stream/0. To learn more about PostClassical Ensemble, go to http://postclassical.com/.